This type of aircraft incorporates more modern technologies than any other previous Boeing airliner, and has been increasingly developed into progressively longer range developments. 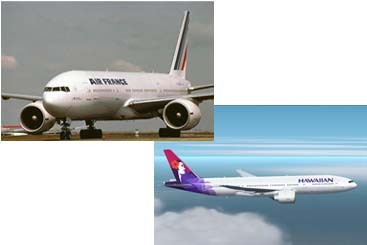 The 777 was initially conceptualized as a stretched 767 but Boeing rather adopted an all new design. Prominent 777 design include is a distinctive fuselage cross section. The fundamental 777-200 was launched in October of 1990 and offered in two versions, these are the basic 777-200 and the 777-200IGW which has a increased weight and longer range and was also called as 777-200ER. FAA and JAA certification was granted on the 777-200 on April 19 1995. The first airline to place an order in the same year was United Airlines in May and for the 777-200IGW/ER model, it was British Airways who made the first order. As of August of 2008, there were a total of eighty eight-200s have been transferred to 10 different customers. The counterpart from Airbus is the A330-300.